Walk among life-size animatronic dinosaurs that move and roar at the new exhibit Dino Days at the California Academy of Sciences in San Francisco. Open daily through May 5. Here are our picks for great spring events and activities for children and families this weekend. Find more events for the whole week in Marin and beyond in our Family Events Calendar. Bring the kiddos for live music, singing, dancing and playing instruments with popular children's musician Megan Schoenbohm. Cost is $10 per child, and siblings under 7 months are free. This is an ongoing weekly class, so drop in as often as you can! Location: Vintage Oaks Shopping Center, 100 Vintage Way, Novato. Event details. Walk among life-size animatronic dinosaurs that move and roar at Dino Days. An immersive festival with its footprint all over the Academy, Dino Days invites you to travel back in time to the Late Cretaceous period and come face-to-face with the largest reptiles that ever stalked the Earth. Museum admission applies. Open daily through May 5. Location: 55 Music Concourse Drive, Golden Gate Park, San Francisco. Event details. Enjoy your baby, reconnect with your body, and meet other new moms in our postnatal mama and baby yoga class. Class is most successful with pre-crawling babies but all are welcome to try out a class and discuss exceptions with the instructor. We want mamas to be able to get out of the house, meet other moms, and enjoy the support and exercise of a yoga class. Cost: $23 for drop-in class. Sign-up online here. Location: 25 Tamalpais Avenue, San Anselmo. For more info, visit their website. On Fridays, the Makerspace is open for youth in grades 5-12 to work in projects of their own design. Explore & develop your skills through a passion project. Bring your ideas and interests and we’ll help you build and create something unique using design thinking. Pre-register by emailing info@cecmake.com. Location: 931 C Street, Hamilton, Novato. Event details. Come see the 6–8th graders of San Domenico School perform Grease: School Version! Tickets: $10 students and seniors, $15 general admission. Purchase tickets here. Location: San Domenico School, Carol Franc Buck Hall, 1500 Butterfield Rd, San Anselmo. Event details. Come see the 6–8th graders of the White Hill school performance of Mamma Mia! Tickets: $15 standby tickets at the door. Location: 27 Kensington Road, San Anselmo. Event details. The class is suitable for absolute beginners as well as those seeking to strengthen the foundation of their existing yoga practice. Are you a longer time practitioner plagued by injuries? A raw beginner wondering what yoga can do for you? Meet at Old Mill Park Amphitheater 10 min. prior to start of class.No pre-registration, weather may cause class to be cancelled. Location: 352 Throckmorton Ave, Mill Valley. Event details. Enjoy the best local and organic produce, flowers, pastured meats, seafood, organic cheeses, yogurt and milk, breads, baked goods, pasta, confections, olive oil, and brunch and lunch offerings! Kids can take a pony ride and visit the petting zoo (10 am–2 pm), try out some arts and crafts (9 am–2 pm) and listen to music (9:30–10:30 am). Event details. Bring the family to the 2019 Golden Gate STEM Fair to view students’ projects on display and participate in event activities. Location: 2100 Bridgeway, Sausalito. Event details. Stretch into the weekend with this fun interactive storytime! For families and kids up to age 6. Free. Location: 400 Magnolia Avenue, Larkspur. Event details. An experience for children 6 and under with singing, stories, learning the service, and community. Service led by Asaf, our JCC Preschool musical teacher and Kol Shofar Rabbis. RSVP appreciated but not required to: Jschreiber731@gmail.com. Location: 215 Blackfield Drive, Tibruon. Event details. Mixed ages 1–5 year olds. Fun and active Music, dance and play class. A selection of children songs in Spanish guides the class from start to finish. Games and activities are related to the lyrics, in order to familiarize the children with the words and their meanings. Cost: $25 per class for drop-in (first class is free). Location: 1414 4th Street, Downtown San Rafael. Event details. You will learn about our farm and CSA, learn what pasture raised means and how farms like Tara Firma Farms are on the front lines to fight climate change, reduce water usage, and build better soil through the latest methods in Carbon Farming! Perfect for families, kids and school groups! *No RSVP required. Show up 15 minutes before! If no guests arrive before tour time, we do not hold the tour. * Location: 3796 I Street Ext., Petaluma. For more info, call (707) 765–1202 or visit their website. Get our for an early spring hike along the lower Montini Preserve Trail. Experience history, nature and community led by Park Interpretive Specialist Ranger Dave. This is a one-mile, slow- paced hike with minor elevation changes. Sturdy shoes and water recommended. All ages, free of charge, no reservation needed. Steady rain cancels. Location: Meet at the Vallejo Home parking lot at the end of 3rd Street, Sonoma. Event details. Drop the kiddos ( K-8 th grade) for some indoor fun. They can run, jump and play in an open gymnastics environment. Bring the kids in on a rainy day or any day to burn some energy. Cost: $30 per child. Location: 70 Digital Drive, Suite #3 in Novato. Event details. Come enjoy Off the Grid’s delicious mobile gourmet food market on Sundays. Eat your way through the largest gathering of mobile food trucks in Marin, listen to live music, and take in great views of the bay and Mt. Tam. Location: Larkspur Landing parking lot. Event details. 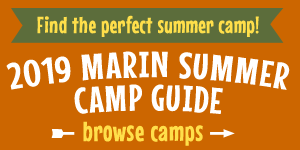 The 9th annual free Marin Camp Fair is in San Rafael at Dominican University this Saturday (Mar. 23), with free activities and over 80 exhibitors, allowing attendees to view a smorgasbord of camps, enrichment programs, schools, S.T.E.M. and S.T.E.A.M. programs, daycare, performing arts, preschools, cooking, educational, sports and other programs available this spring and summer. Register online here. Location: 836 4th Street, Downtown San Rafael. Event details.